Epoxy Garage Experts | Free Flooring Estimate Call Today! Flooring Contractor - Top Rated Concrete and Epoxy Flooring Contractor Serving Ft Lauderdale 33324 Palm Beach County, Broward County and Dade County! Just like our slogan goes, The Epoxy Garage Experts are the one and only rockstars of epoxy..We make it rain sparkly polished floors. We've been doing epoxy floors for over 10 years so you are in safe hands with us. When you work with us, you know what you're getting. A fair price and a job well done. Here's what you won't get..
We take pride in our work and cater to your needs like you are our only client. Heck, we'll even take the time to train you how to do epoxy floors yourself if you would like in on of our classes. Bottom line is that our customer service is great and we do what no other company can do. The specialty, creative jobs are our fortay. We've done it all from Garages to Ferrari Showrooms to Lu Lu Lemon (Not to Brag). If you want DYE, Epoxy Stencils, Intricate projects or a sweet place to park your car. We're your guys. We've done some of the biggest projects in South Florida and we are here to serve you! ​Many homes are stuck with dull, gray, low-quality garage flooring. Most homeowners are complacent with having the same garage floor everyone else. They simply shrug it thinking of it as merely, “where you leave your car at night.” From home storage needs and leaking chemicals, greases, and oils, the garage isn’t the place many consider spending a considerable amount of money. However, a better garage floor installation is effective at boosting a home’s overall property value, as well as helping protect the surface, the foundation, and structure of your home. By providing a better seal, a firmer surface, and better protection from more forms of stains and hazards, the right garage floor coating contractors can transform any garage into a more functional space. When it comes to trying to find local garage floor coating companies that can help you with your home, it can be tough to find the right fit. Some garage floor coating installers charge high prices for basic flooring services, while others rush through your job and leave a poor finish. When it comes to hiring a professional team of garage floor contractors, there’s only one name that comes through consistently. 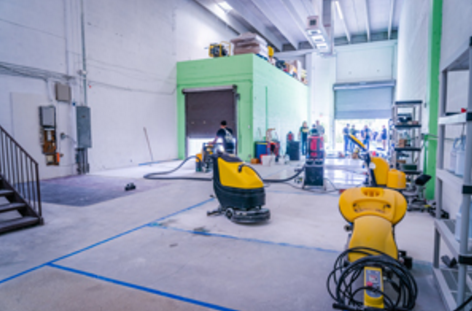 Garage Epoxy Flooring Contractors has been the premier choice for garage floor epoxy contractors in the greater Fort Lauderdale, Florida area for a long time. The Majority of our business comes from Broward County, Fort Lauderdale, Hollywood and Davie. With more experienced epoxy garage floor installers, lower pricing, and only the best tools and equipment, we provide you a level of quality that you can’t find anywhere else. When you need a great new garage floor but are on a budget, you’ll find that we offer the best solutions for your home out of any other local company. 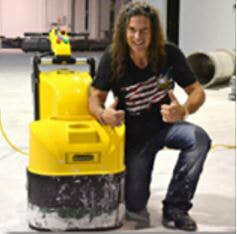 Concrete Contractor - Top Rated Flooring Provider Specializing In Polished Concrete & Epoxy Flooring. ​Your garage floor doesn’t have to be boring. Unfortunately, many professional garage flooring companies are expensive and don’t offer all of the services you’re looking for and require. It can take a long time to find a company who can offer the type of garage floor you need, and when you do, they may be far out of your budget’s price range. Other homeowners simply try to research how to install epoxy garage floor or how to do their concrete polishing themselves. While this is certainly a way to save some money if you know how to do it, you could wind up causing far more harm than good. Suddenly saving a few bucks becomes an expensive mistake, one that may leave you without a functional garage. And more great flooring solutions for your garage. Before you waste time with another expensive and inferior quality garage flooring company, save yourself a lot of time, money, and headache by choosing us first. ​We use only professional grade epoxy and floor seal solutions, giving you a sturdy, long-lasting epoxy finish that will leave your garage looking better and protected for longer. We guarantee you’ll love your brand new epoxy floor, no matter which style or look you’re trying to achieve. For a better epoxy floor service, just give us a call. Other companies will only offer one type of flooring epoxy, taking a one-size-fits-all approach to garage floor solutions. As a result, you’re limited in what options you can choose from, and you usually wind up paying more for services you don’t even want. But our team gives you more affordable options on more styles of epoxy, achieving the look you’ve always wanted for your garage floor. We can find you the perfect color and style that best suits your home, all without costing as much as other local epoxy companies. When you need fast, convenient, and affordable epoxy flooring specialists, you won’t find a better team anywhere else. Our epoxy floor options aren’t just for our local area residents either. We have been pouring more epoxy finishes for commercial properties and industrial companies than anyone else. When you choose us, you’re getting the same level of professionalism and lowest pricing possible that we offer our residential customers. Just leave it to us when you require the peace of mind, knowing your floors are protected the right way. ​When you need a better concrete floor company in the greater Fort Lauderdale, Florida area, you’ll find that we offer lower concrete prices on all of our top quality service options. For a better concrete floor garage at the lowest pricing possible, we have everything you need for whichever style you’re seeking. Other concrete flooring companies will only offer poured concrete, giving you the same boring garage everyone else has in your subdivision or cud de sac. And while this is the most accessible and affordable solution to garage flooring, it does little to help you keep it clean. The porous surface of concrete easily absorbs liquids, oils, greases, paints, and odors, and can crack and chip away much faster than you may initially expect. Our professional concrete flooring options leave your garage with a great looking and durable concrete finish, outperforming any plain poured concrete floor. Unfortunately, like with epoxy flooring companies, many concrete flooring companies charge more without delivering the quality you had expected. This leads many homeowners scrambling how to figure how to stain concrete themselves but don’t have the experience to do it correctly. You can spend coutless hours doing your homework at Concrete Network or other online resources, you won’t have the level of quality that you deserve. Before you try to figure out how to polish concrete on your own, let us help you. You’ll still save more than with anyone else, and you’ll get the level of professional finish your garage needs. ​Our team has spent many years perfecting our techniques on how to seal concrete, stain it, and polish it, giving you a better looking concrete surface. By hiring Garage Epoxy Flooring Contractors, you’re getting the most experienced team of flooring experts in the area. By having access to more forms of concrete flooring, we can offer the best solution no matter how big your job is, or what sized budget. Unlike epoxy flooring, concrete floor installation services are not just limited to your home’s garage. There are many techniques that we employ that can be used throughout your home or business, as well as the surrounding exterior areas. Whether you’re looking for a better quality garage floor, or just don’t want the same basic home flooring materials, our concrete flooring solutions offer a great alternative. Why Are Epoxy Garage Experts The Most Reliable? The Florida residential market is highly competitive, whether it be for short term rentals, long term residential rentals, or in buying and selling homes. Because of market saturation, by the same handful of big name home builders, most homes begin to look identical after awhile. This, while not a particularly poinant issue, could make it harder to sell or lease your home later on. With quality epoxy and concrete floor solutions for your garage and other areas of your house, you can make your home stand out like never before. For not a whole lot of money, you can have a home that is distinctly unique, allowing it to wow others on a budget. Like many home improvement options, however, this will only work if you have chosen a contracting team that knows what they are doing. Other companies try and take shortcuts, using low-quality tools and equipment. More often than not, they rent them from discount rental services, which don’t work as efficiently as professional grade tools will. As a result, you could find uneven surfaces, scratched finishes, and even structural damage. Before you have to find a second company to correct the mistakes of the first one, be sure to call the right choice first. Why Polish Concrete or Lay Down Epoxy Anyway? ​People have been using poured concrete flooring for their garages for decades. It’s sturdy, cheap, and if poured right the first time, you’ll probably never have to do a thing to it again unless major cracks form. Unfortunately, it also looks exactly like your sidewalk, leaving your garage looking dull and plain. Concrete can also make it harder to keep your garage clean, and may even be more susceptible to ants and other bugs. With a better finish over your existing concrete flooring, you can make it easier on yourself to keep it clean. The smooth sealed finish of epoxy and polished concrete makes it easier to sweep, use a leaf blower, or rinse your garage out with a hose. Oils and dirt won’t stick nearly as easily, and your new surface will look much more expensive…and only you will know the truth about how affordable it was. 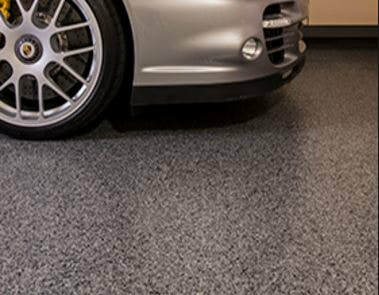 ​Your garage flooring solutions are not an area that you want to skimp on quality. When epoxy and polished concrete flooring is installed correctly, it will look like an entirely brand new garage floor. You’ll have a showroom finish that is ready to take on anything your life will send its way, from dirty work boots and muddy tires to heavy mechanical equipment and heavy objects falling from shelves. When done properly, your garage floor, and other surfaces will have a brand new protective shell that lasts. American Epoxy Systems and Epoxy Floors For Less are second rate in comparison to us. Fill out this quick form so we can answer your questions or concerns.